There are quite a few things that are synonymous with fall: crunchy leaves, pumpkin spice lattes, pumpkin patches, knee-high boots… the list goes on and on. When it comes to fall-inspired foods though, I have a few specific things that come to mind. I always think of banana nut bread and pumpkin pie. The smell of them cooking in the oven radiates fall throughout your home. It’s like living in a Yankee Candle. I absolutely love it. True story: I once thought I’d be super Martha Stewart-esque and bake a pumpkin pie from scratch. Move over Libby’s can, I thought to myself, I was headed straight to the source to get my ingredients! So, I went to the pumpkin patch and picked out a pumpkin. A pumpkin, that in my mind, I was going to gut and use to make my Pinterest-worthy pumpkin pie. Only thing was, who knew that the pumpkins at the patch are not the same as the ones you use for baking? I found that out the hard way. I removed the pie from the oven and was so proud of myself. I must’ve made my boyfriend come over at least 5 times to admire it as it cooled. The admiration quickly turned to laughter though, as I went to slice into the pie. We cut into it and as we pulled the first slice upwards, the entire rest of the pie filling came up with it. It was like a massive mound of pumpkin spider webs. 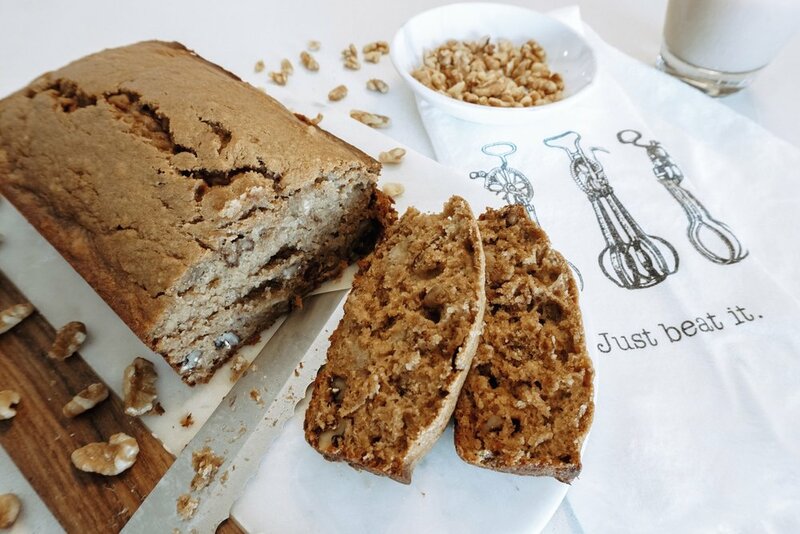 So, without further ado, here’s my yummy banana nut bread recipe. No pumpkin strings attached. Prior to starting the recipe, freeze 3-4 overripe bananas (the peel should be black). Before you plan to make this recipe, take the frozen bananas out of the freezer, let them thaw at room temperature, then peel and mash them. This takes about 2 hours, so keep that in mind. Freezing the bananas will add sweetness to the banana bread and make the flavor better overall. I’d love to hear if you end up trying this recipe and what you think. So, let me know and be sure to tag me on Instagram @melaniemineau! I made this delicious shrimp and zoodles recipe for dinner last night and after posting it on my Instagram stories, I received several requests to share the recipe. Next time, I'll be sure to take lots of photos of the steps. This dish is super easy to make though and I used spices I already had in my pantry, which many of you will likely already have in your spice collection as well. I'm all about low-carb dishes these days, since I try to track my macros daily. I eat most of my carbs in the morning, whether it's toast, a luna bar, a banana, or yogurt. By the time dinner rolls around I usually don't have lots of carbs left. That's when I opt for zoodles! If you aren't tracking your carbs though or need more carbs, you can easily swap the zoodles for a healthier pasta (almond flour, veggie, etc.). I hope you guys enjoy this recipe. If you end up trying it, let me know in the comments down below! 1. In a large skillet, heat the avocado oil and garlic over medium heat2. Let the garlic cook for a few minutes until fragrant3. While the garlic is heating, place another large skillet on medium heat for the zoodles4. Add shrimp into the skillet with the garlic5. Add in the basil, red pepper flakes, sun-dried tomatoes and fresh ground pepper to the shrimp skillet6. While the shrimp are cooking (about 5 mins--you'll know they're done when they're totally pink), spray your cooking spray on the second skillet7. Add your zoodles to the second skillet that you just sprayed8. Cook the zoodles (really you're just blanching the zoodles) for 3-5 minutes9. Once zoodles are cooked al dente, place them in a pasta strainer in the sink to remove excess moisture10. Take the zoodles and place them on some folded paper towels and press lightly to get rid of additional moisture, because nobody wants watery zoodles ;)11. Divide the zoodles into 2-3 servings and top with the shrimp and sun-dried tomatoes. You can leave the oil in the pan or add to the zoodles for more flavor12. Top each serving with fresh parmesan cheese13. Enjoy while warm!